Net Entertainment (more commonly known as NetEnt) is the leader in online casino game software, but no longer do you need to be stuck at your desktop or laptop computer to be able to enjoy these premium, high quality games. Many of our top rated mobile casinos now host a wide range of NetEnt’s finest casino games, ready for real money play on the go anywhere you can secure an Internet connection from your smartphone or tablet. Leo Vegas Casino – a multi-award winning mobile casino which is believed by many to be the best mobile casino on the market. Thrills Casino – offering mobile casino games from many of the best software providers, including Net Entertainment pokies and table games. Guts Casino – this multi-provider casino offers a variety of NetEnt games for mobile play with no downloads required. G’day Casino – an Aussie themed casino with NetEnt mobile games available in instant-play mode for smartphones and tablets. These casinos are highly regarded within the online gambling industry for their stringent security, high quality game collections and fast deposit options. Sign up using our links to take advantage of some incredible welcome bonuses for new players, many of which include free spins on selected NetEnt pokies. Net Entertainment’s range of mobile optimised software is known as the NetEnt Touch collection. Games started to be unveiled under the NetEnt Touch range back in 2011, at a time when they could only be played using an iOS powered device. As the demand for mobile gaming has grown, mobile optimised games using the NetEnt Touch platform can now be accessed on all modern smartphone and tablet browsers, including iPhone, iPad, Android and Windows Phone. NetEnt’s mobile casino games retain the same high quality and special features as their desktop counterparts, they’ve simply been optimised for use on the smaller screen. Flip your phone or tablet into horizontal mode and use the touchscreen to place your bets and spin the reels and you’ll be amazed how easy and effective this method of play is. While you won’t find all the NetEnt desktop titles available for mobile play, many of the most popular games are available in Touch format. The mobile offerings are mostly limited to the pokies, but you’ll also find a decent selection of NetEnt table games available for mobile play. We’ve outlined just a few of the best NetEnt Touch games to give you an idea of the fun that awaits at your fingertips. 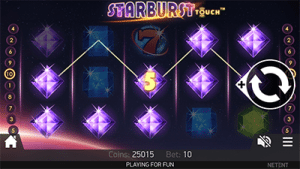 Starburst – by far one of NetEnt’s most popular online pokies games, Starburst is reminiscent of social media games like Candy Crush and Bejewelled Blitz, with reels filled with sparkling gems which spin to create potential winning combinations. Starburst makes a great mobile game as the graphics are bright and vivid without being overly detailed, so nothing is lost when shrunk to the screen of your iPhone or Samsung Galaxy. Containing several bonus features, Starburst is a great choice for free or real money play on the go. 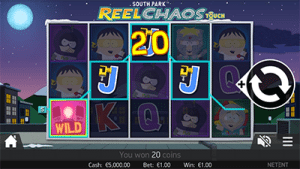 Roulette Touch – NetEnt’s only mobile optimised roulette game, Roulette Touch offers a simplified version of roulette where standard inside and outside bets are allowed. The game looks quite different on mobile, as the betting table takes up the whole screen until you’ve placed your bet and then the roulette wheel pops up for you to watch the action unfold. The touch screen function of mobile makes it incredibly easy to place your chips onto your chosen place on the betting table. 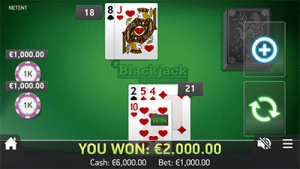 Single Deck Blackjack – NetEnt’s blackjack range translates beautifully to the smaller screen of your mobile, although there are some distinct differences compared to the desktop version and the layout has been simplified to suit. To play Single Deck Blackjack at its best, flip your device to horizontal mode and then tap on the relevant chip to place your wager. After your cards are dealt, tap the red hand button if you want to stand, or the green plus button if you want to hit. Once you’ve tapped the red hand, the dealers cards will be revealed and your account will either be credited with your wins or deducted of your losses. Tap the buttons to deal again or quit the game. NetEnt release new games regularly, many of which find their way to the mobile casino sphere, so sign up at any of our recommended casinos to stay in the loop for new mobile relases as they drop. Is it safe to play NetEnt mobile games? Our recommended mobile casinos are protected by the same level of secure socket layer digital encryption security offered by the full desktop site, so you’re just as protected when playing Net Entertainment games on your mobile device. When making a real money deposit on your mobile, use your common sense to be mindful if you’re using a shared or public Wi-Fi connection, and make sure your mobile is charged so it doesn’t run out of battery mid-play. Want to give NetEnt games a go from your smartphone or tablet? Tap our links to sign up at Leo Vegas Casino and claim a new player 200% matched deposit welcome bonus plus 200 free spins to use on selected pokies.